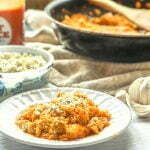 This low carb buffalo cauliflower rice with chicken dish is a very easy and delicious one pot dinner that you can make in just 15 minutes. This is the perfect quick and easy low carb dinner or lunch and each serving has only 3.7g net carbs! Add the butter and garlic to a large saute pan. Once the butter melts and the garlic fragrant add in the hot sauce. Whisk everything then add in the raw cauliflower and cooked chicken. Mix it well and then cover with a lid. Cook for 5 minutes and then take off the stove and sprinkle cheese on top. Broil unit the cheese is melted and then it's ready to eat!